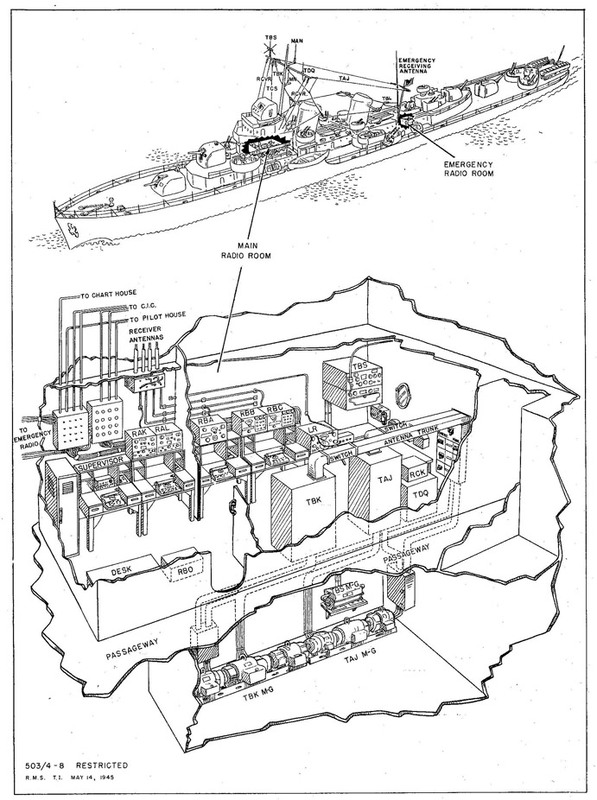 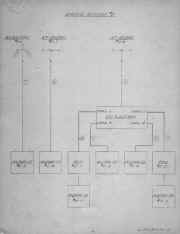 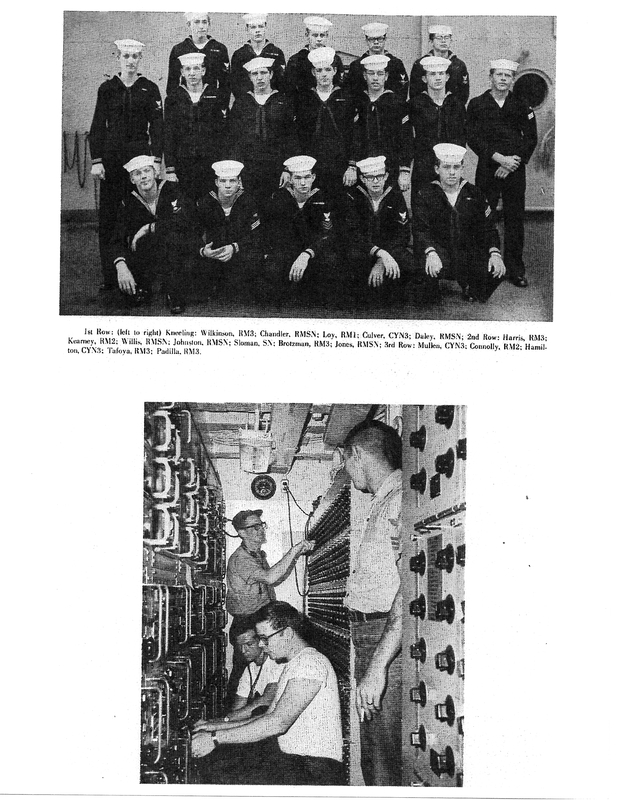 The multicoupling system to be installed on a new vessel, the Destroyer Leader DL-2 [DL was later called DDG] is shown in Figure 3- 30. The communications system on this ship uses a minimum number of antennas and is designed for maximum flexibility. 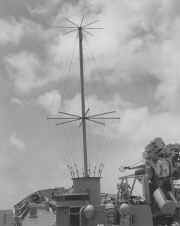 There are six antennas used with the multicoupling system: two 35 -foot whips and one wire antenna for receiving, and two 35-foot whips and one flat -top antenna for transmitting. 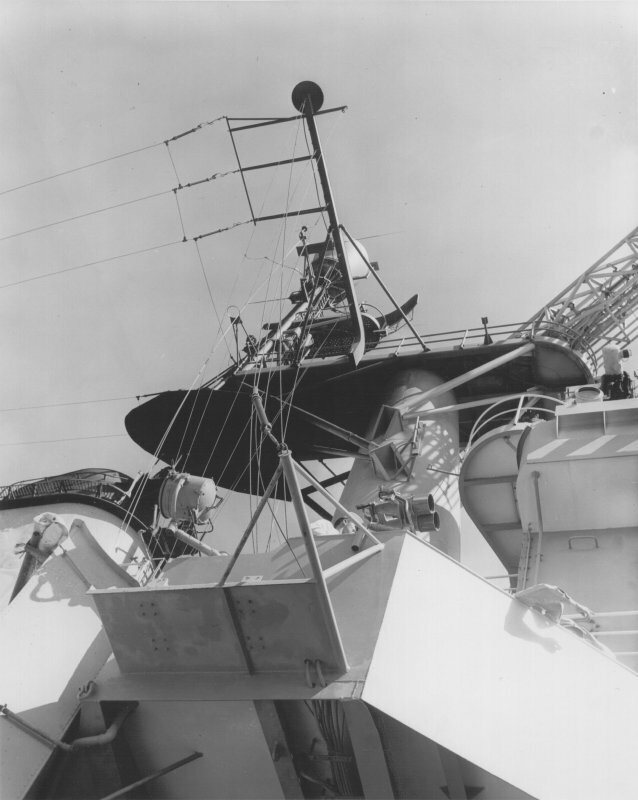 The receiving antennas are located forward and the transmitting antennas are located aft so as to provide the best possible isolation between the two types. 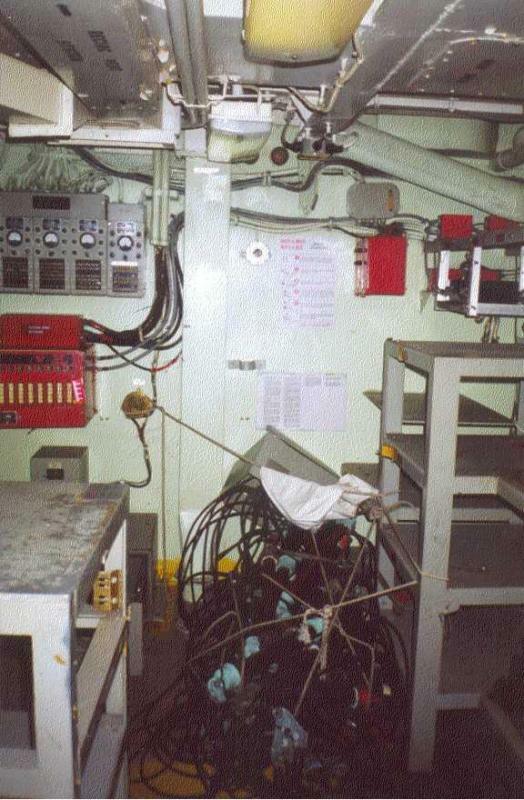 Provision is made to use any equipment with any of the antennas (except the flat -top) in the event of failure or damage t o certain portions of the ship. 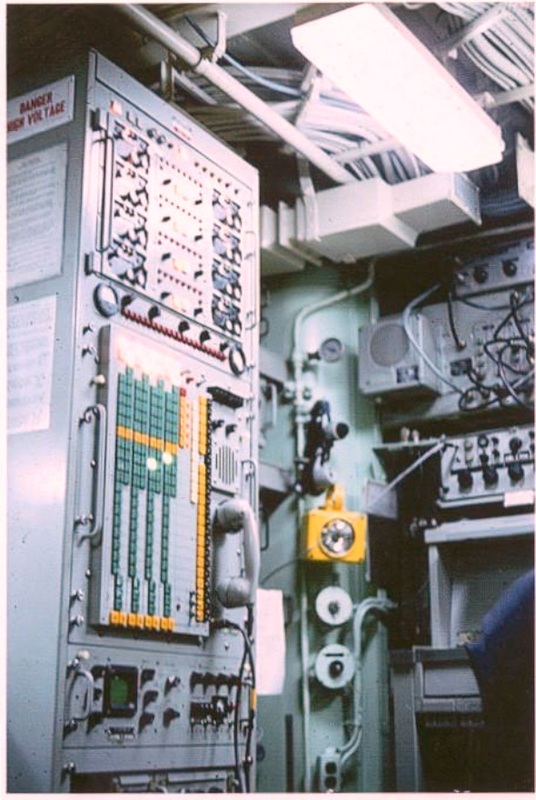 This ship uses three AN/SRA-9 receiving filter assemblies. Two located at the central Receiving Distribution Unit and one at the Auxiliary Distribution Unit. 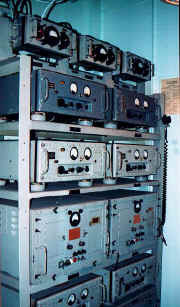 Three transmitting filter assemblies are located at the Central Transmitting Distribution Unit. One of the filter assemblies, F-159/SRT has a crossover frequency of 375 kc with switching provisions for shifting the crossover frequency to 425 kc; another filter assembly, F-160/SRT has a crossover frequency of 1750 kc; the third filter assembly, F-161/SRT, has a crossover frequency of 3250 kc with provisions for shifting the crossover frequency to 3750 kc. 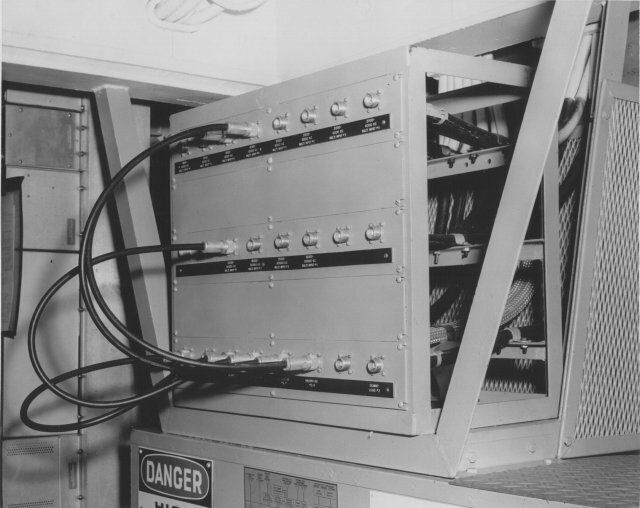 The three transmitting filter assemblies are stack-mounted. A four-pole, three-gang, Filter Selector Switch is mounted on the rear of the cabinets. 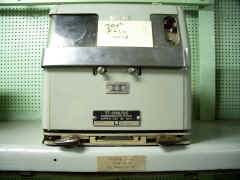 The purpose of this switch is to allow both transmitters to be connected to any one of the three filter assemblies or to allow one of the transmitters to be connected directly to the antenna. 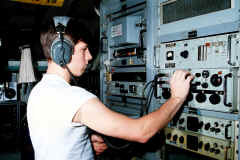 This permits more versatile use of the transmitting equipments . 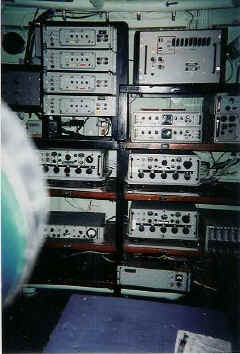 Radio room 1 QuickTime panorama - R-390A, SGC-1, SRR-19, BRR-3, WRR-3, R-1051, URA-17, TTY patch panels, xmtr & rcvr switchboards, SRC-21, SRR-11? 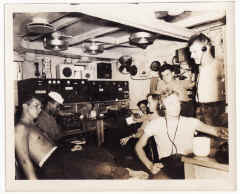 USS Hornet in WW2 maybe? 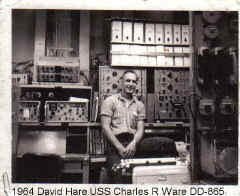 Please send e-mail with any info. 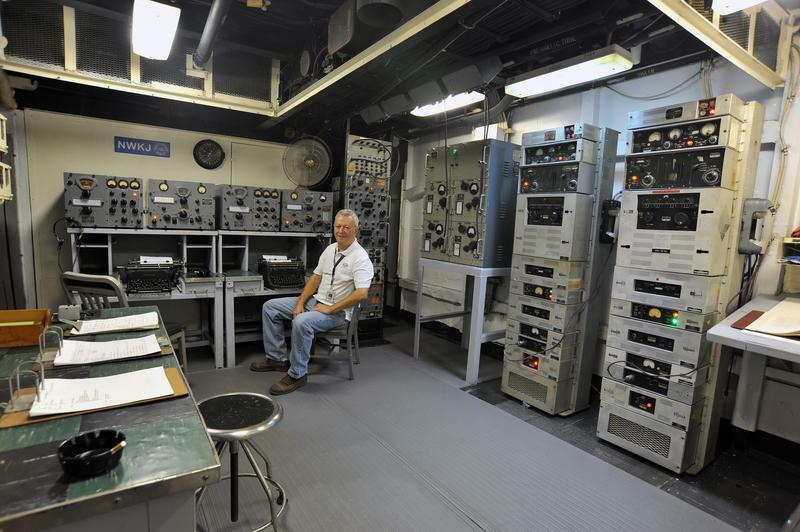 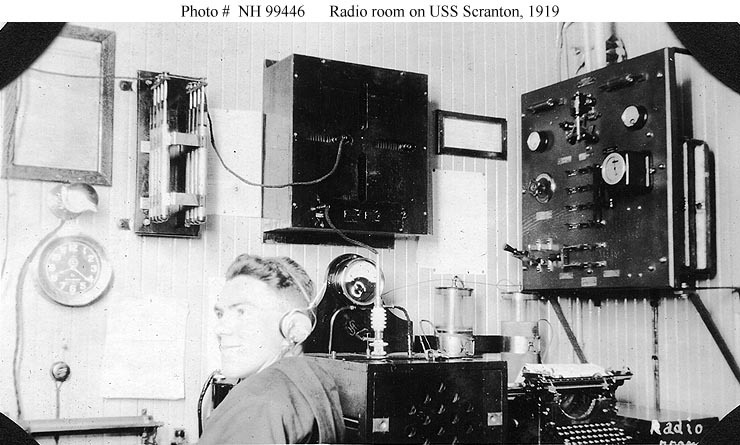 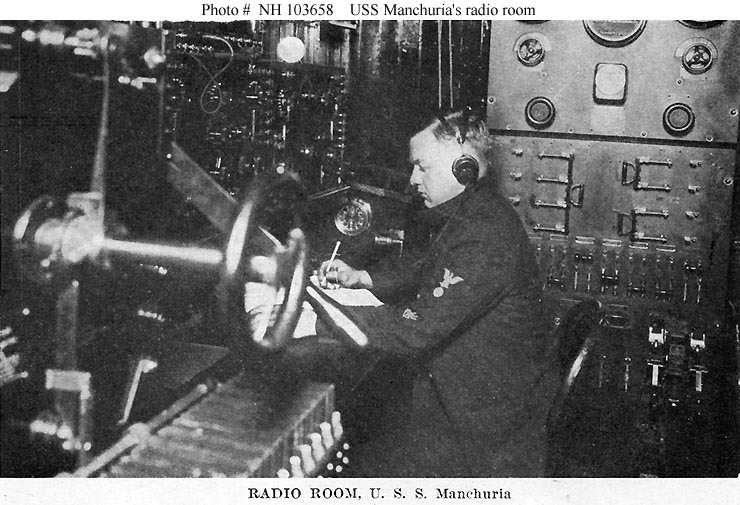 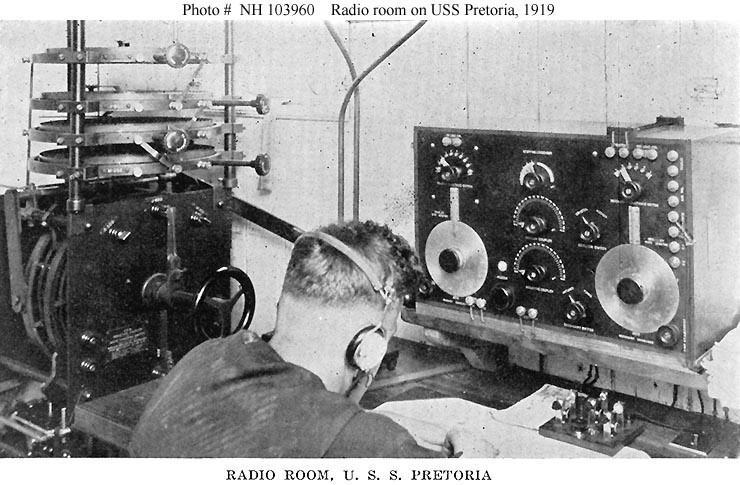 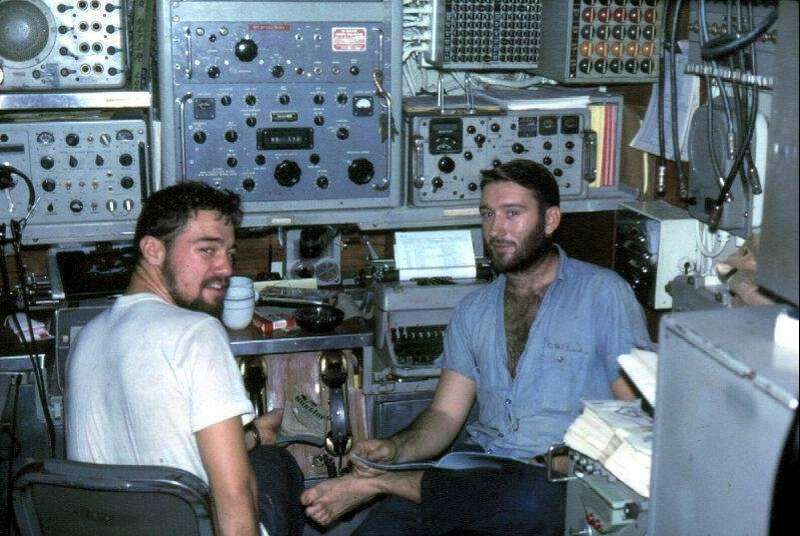 Caption says "Nerve center of the ship is the shack - Communications Office. 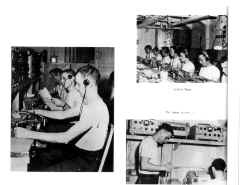 Here, among the maze of cable, typewriters, senders, and receivers, contact is maintained with other ships of the fleet, with bases, and intership phones." 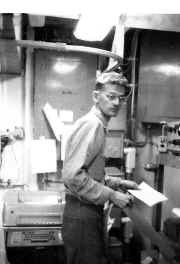 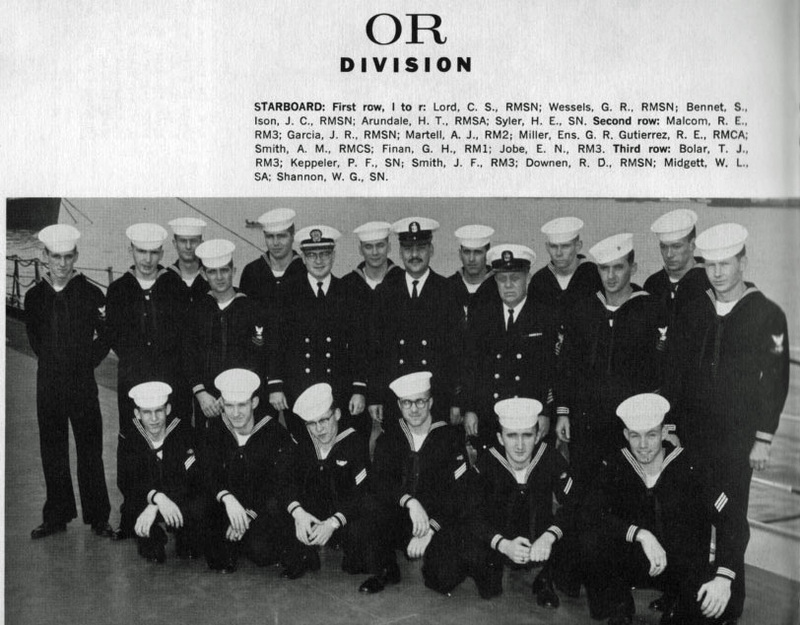 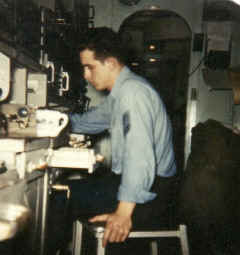 Looking forward aboard USS Electron, late 1950 at Oakland Naval Supply Center. 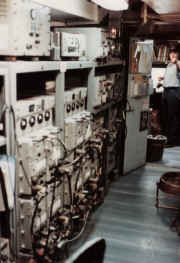 With 30,000 electronic line items loaded for service with the Far Eastern fleet. 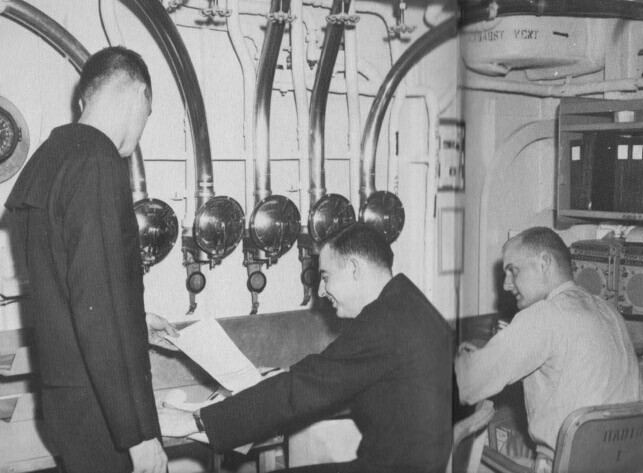 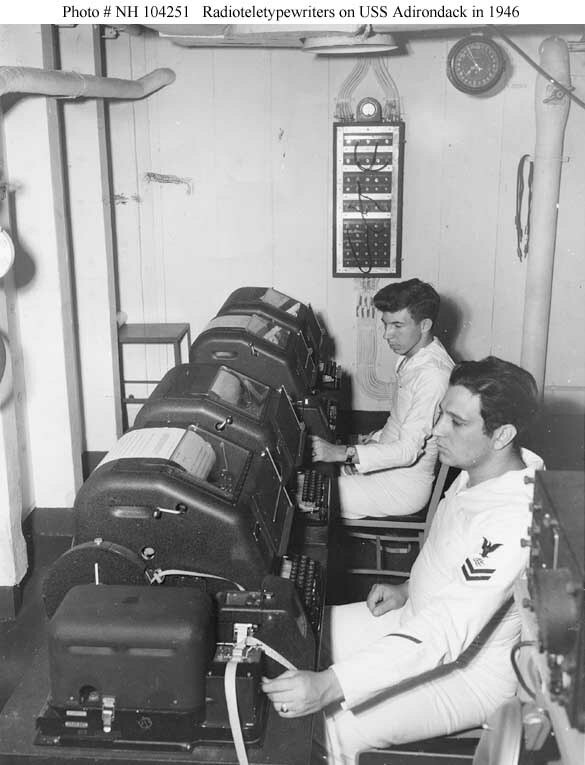 Radio-teletypewriters in use aboard Adirondack (AGC-15) circa 1946. 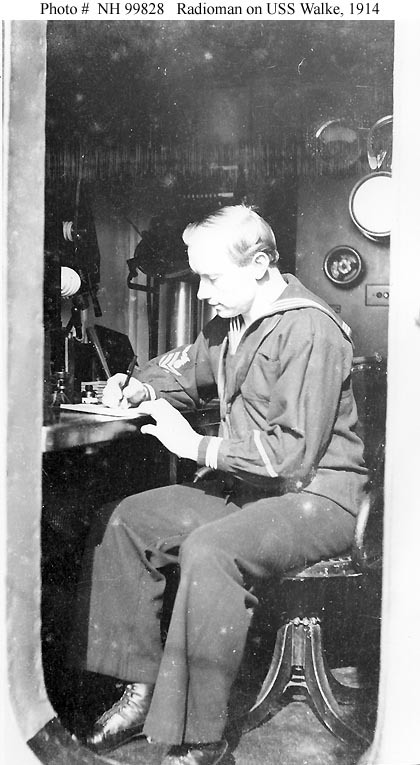 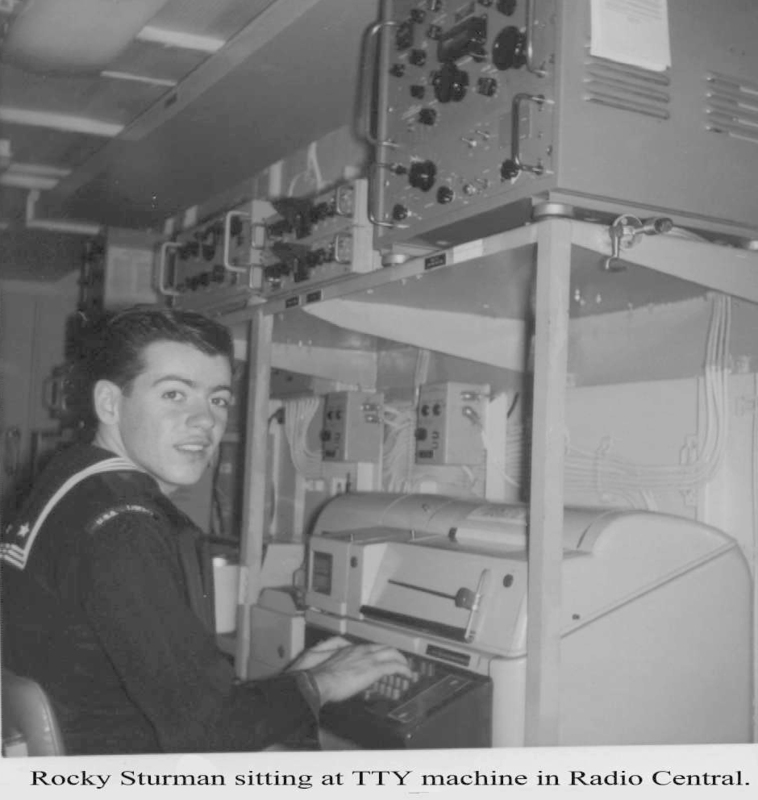 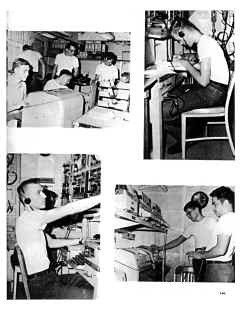 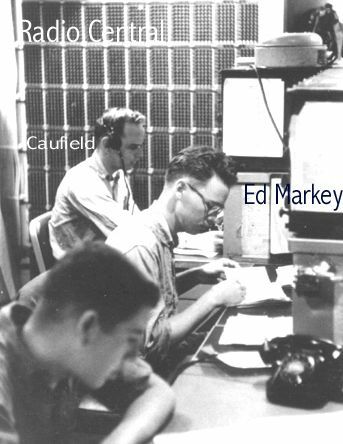 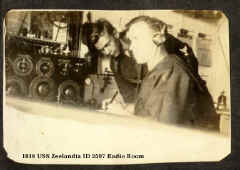 Radioman Second Class J. V. Miceli is shown in the foreground seated at the Model 19 teletypewriter used in copying MERFOX radio broadcast schedules. He is using the tape machine next to the teletypewriter to work with a message punched onto paper tape. Seaman First Class J. K. Wooster is seated at a Model 19 teletypewriter that was used to handle traffic to and from NSS, the Navy's long-range communications station at Annapolis, Md. 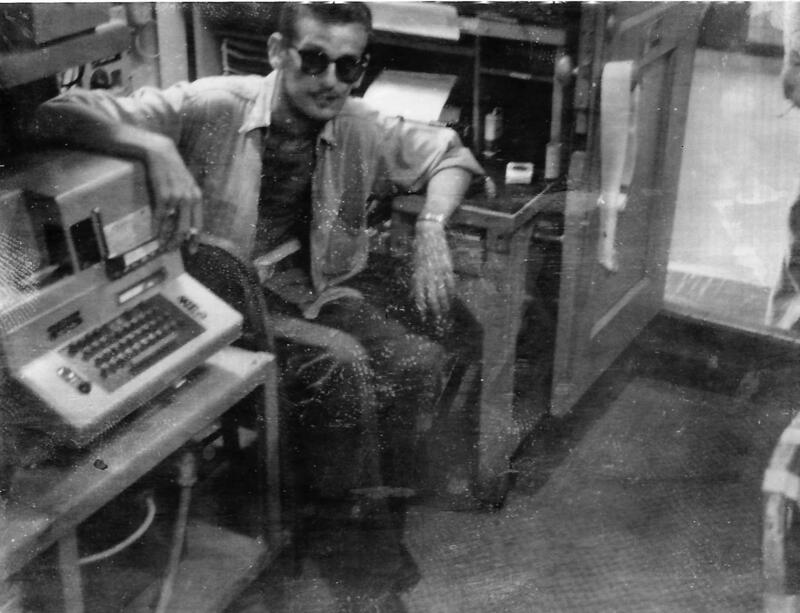 Behind him are two Model 15 teletypewriters. 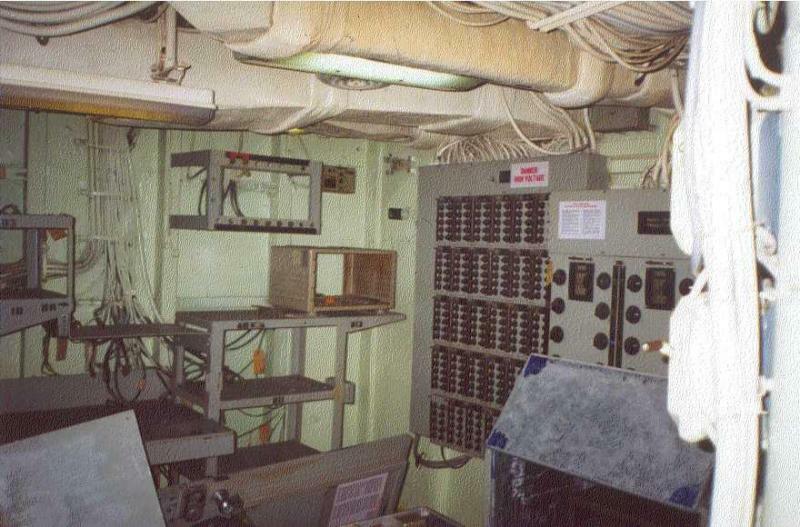 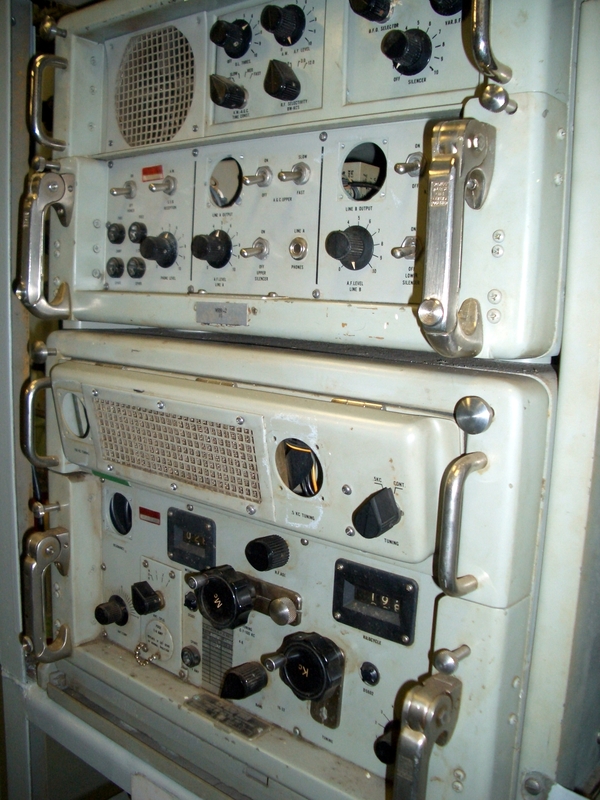 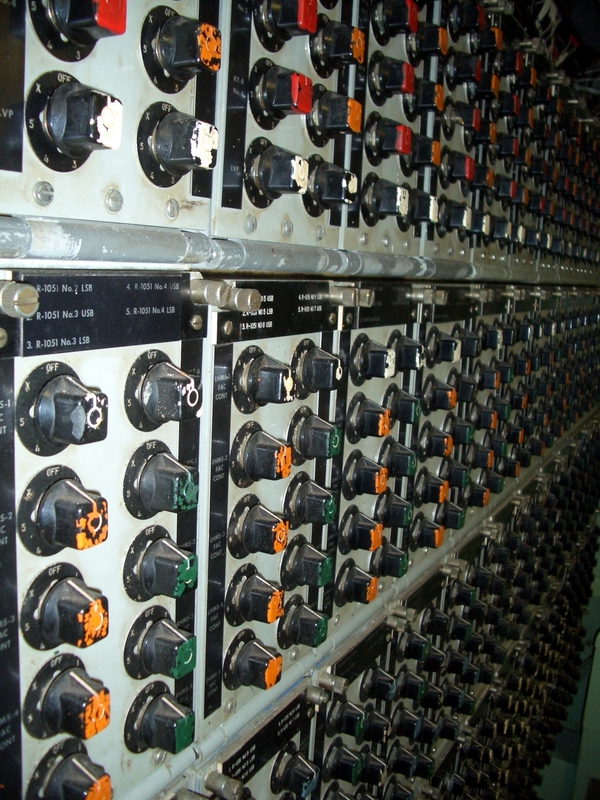 The transfer panel on the rear bulkhead was used for connecting various teletypewriters throughout the ship. The photo may have been taken on 26 August 1946; it later appeared in All Hands magazine. 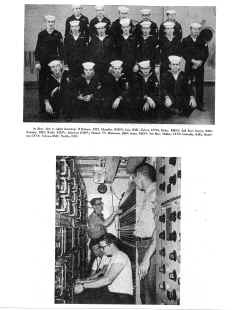 US Navy photo # NH 104251 from the "All Hands" Collection at the Naval Historical Center. 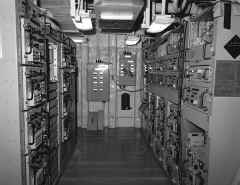 Radio 1 (Radio Central) -"...different angle of Radio 1.You can see just a little bit of the transmitter patch panel. 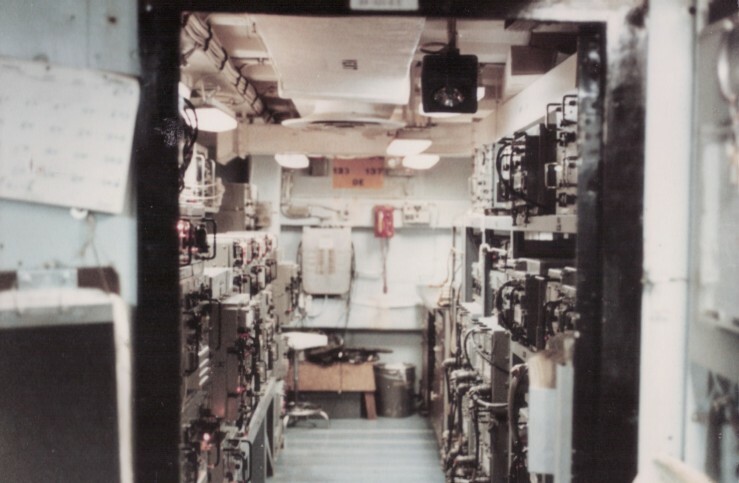 Its just as you go out the door on the left. 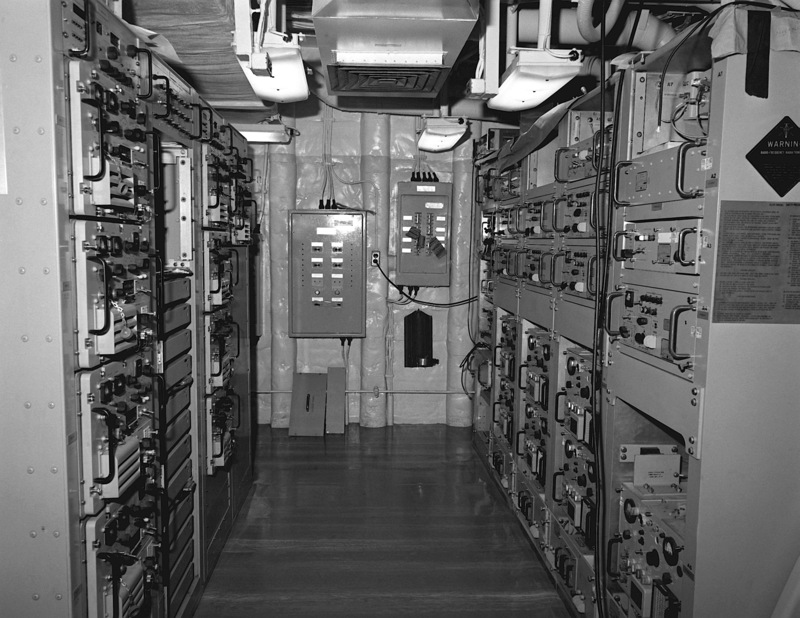 Across the passage way is the door that led to Troop Radio. 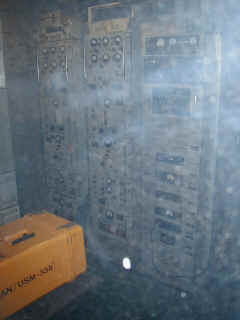 It looks dark in there so this was taken late at night on the mid-watch. We were out to sea probably and standing two section watches. 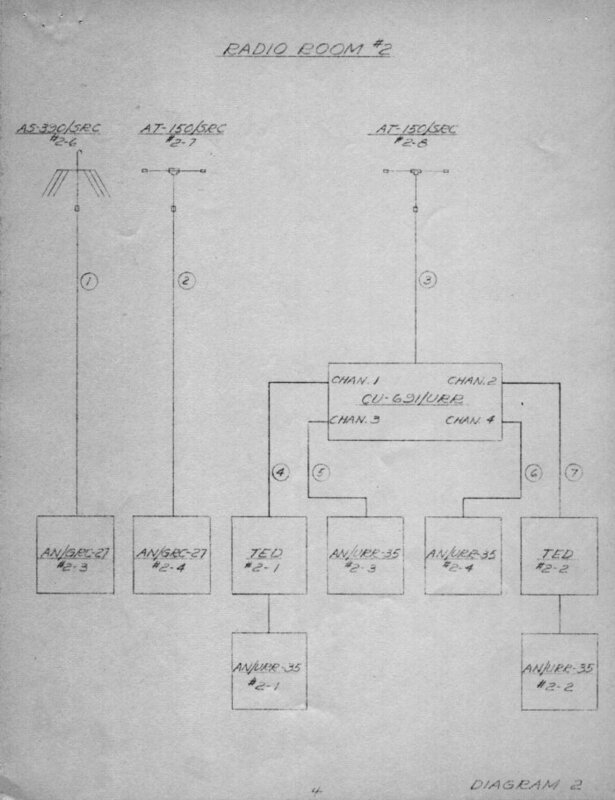 Each section was divided into an A & B group. 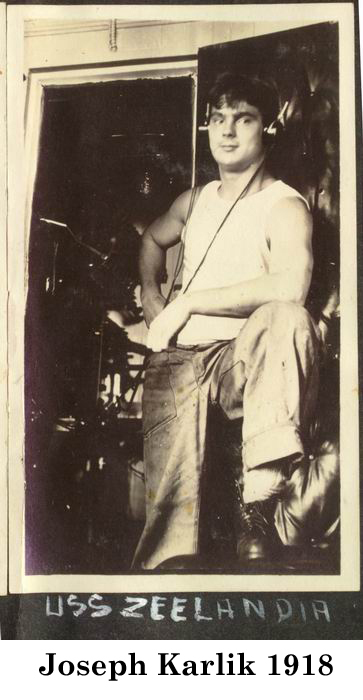 We would then do chow to chow watches. 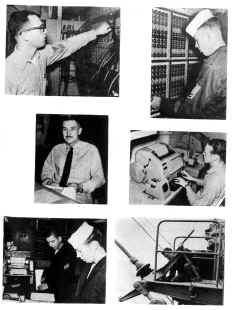 One day on One day off. On the off day you still had work to do even though you were not on watch. 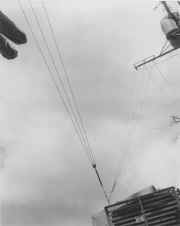 That's me messing with my camera. Across from me was the Supv. 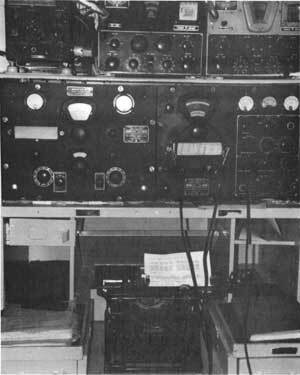 desk with the 1MC intercom. 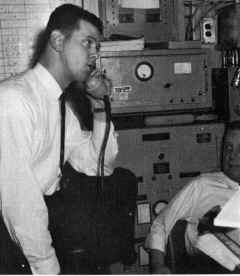 Tony in Troop Radio - "I was practicing on my speed key. It was a Vibroplex I bought off another radioman who was leaving. 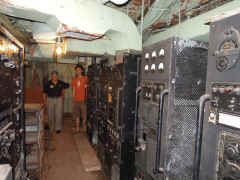 Against the rear bulkhead was a telephone switchboard. To my left in the gray cases were TEDs, uhf gear that were used for aircraft mostly. 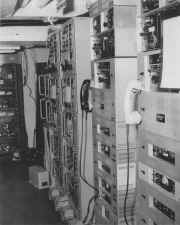 They used fixed crystals. 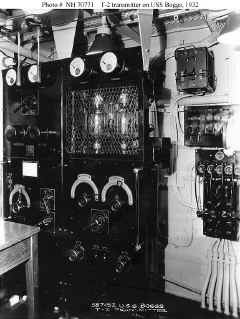 Above is a single side band transmitter (SSB-1). 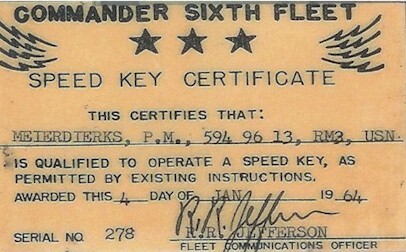 I don't remember using it very often. We were one of the first to have. 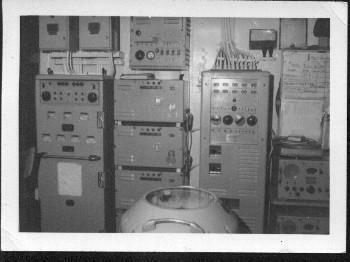 Later we got a bigger one installed down in Radio II where a lot of the big transmitters were located. 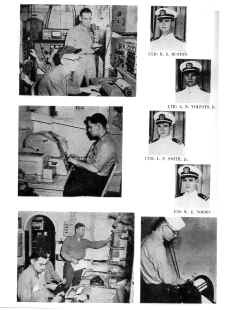 It was also where the ET's had their work place, etc. They were primarily SRTs and one had a 500 watt booster. 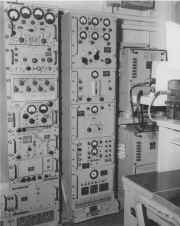 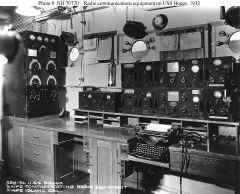 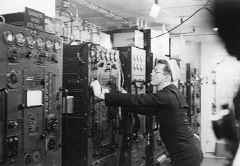 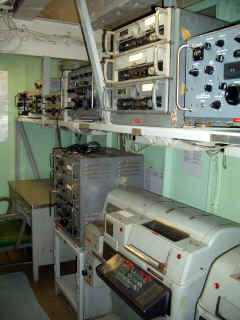 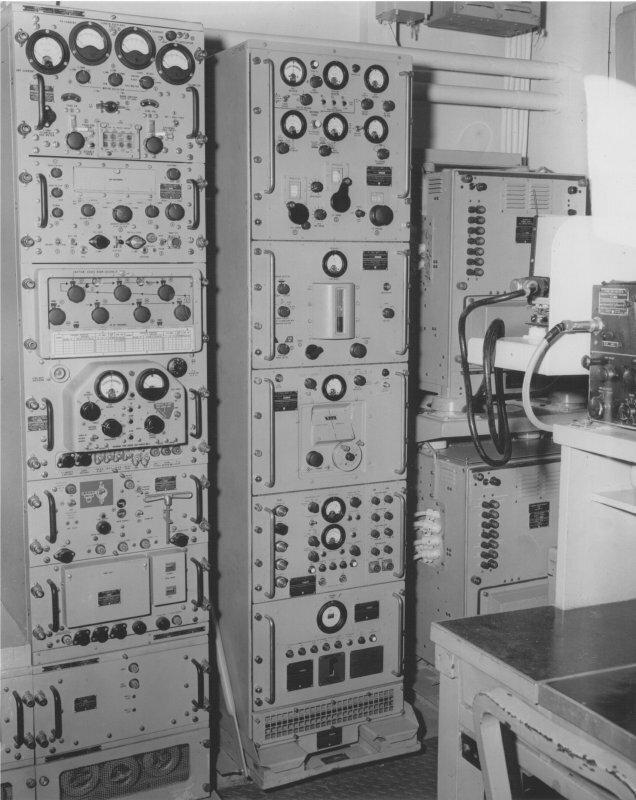 We also had one in Radio III which was our emergency radio room. 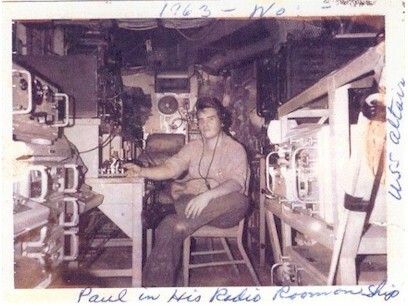 The ship's company Radioman 1st Class used it as his own private compartment at sea (rank). 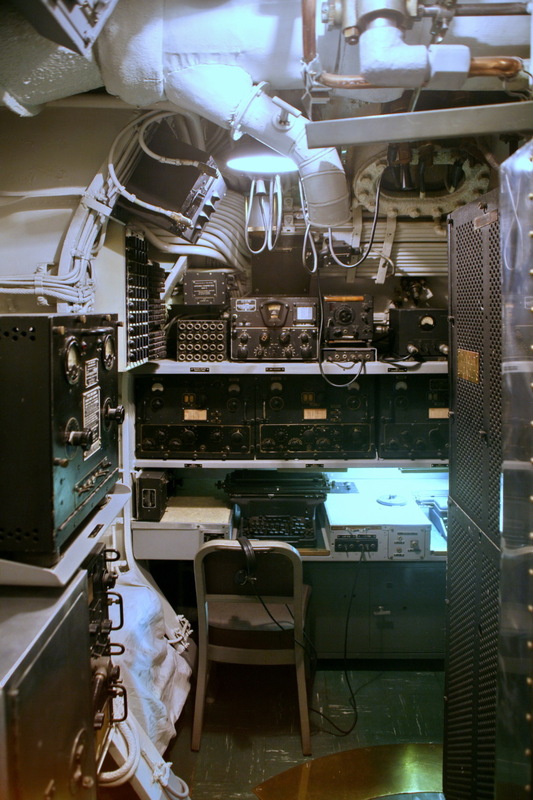 On the opposite bulkhead behind me was all the troop radio gear. 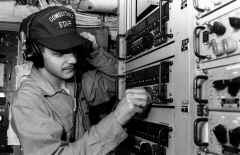 I believe they were uhf also. 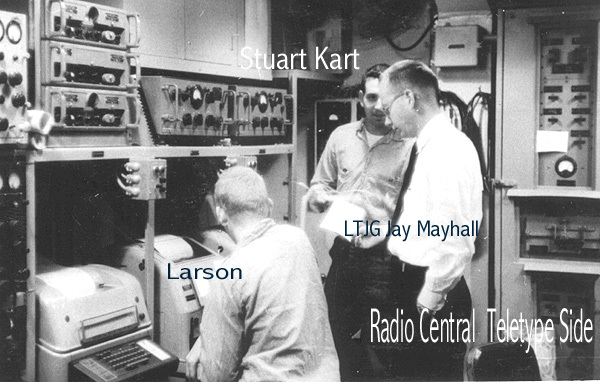 There were a couple of TCSs on that side too." 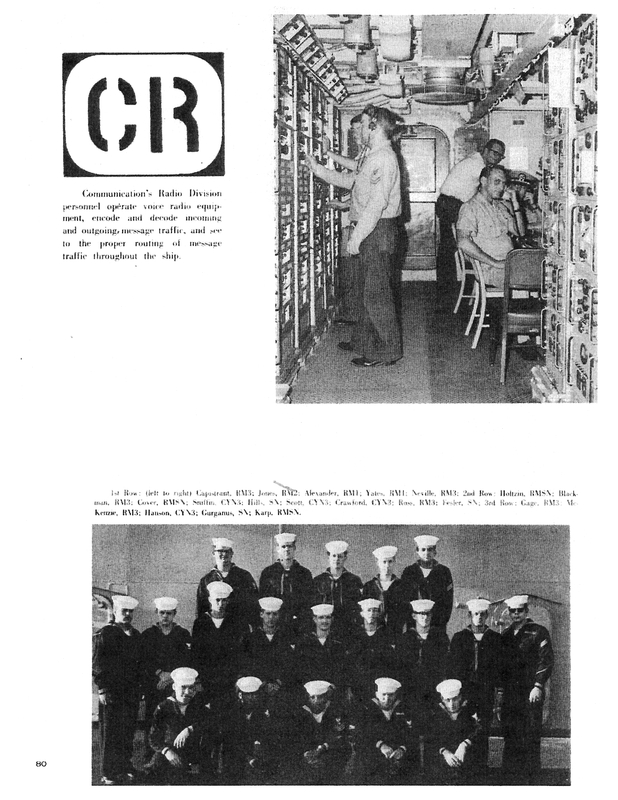 Radio Central - "...more clowning around. 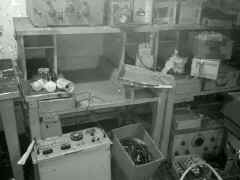 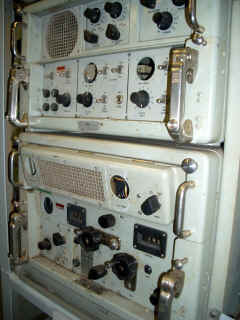 The equip on the right (top) was a LM frequency meter or calibration meter. 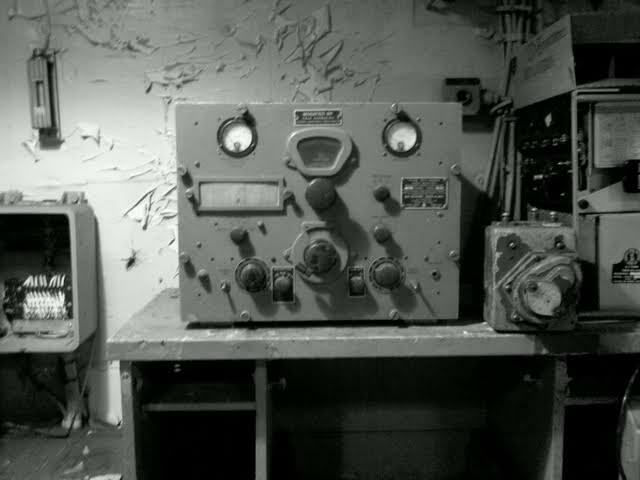 The bottom was a field strength meter. 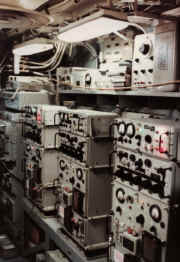 We could patch that into the receivers to get the correct freq." Troop Radio - Tony doing maintenance on an SRR. 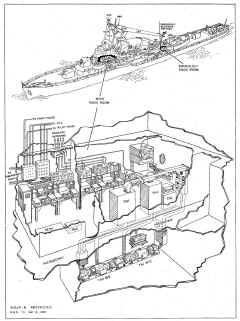 "You can see the GRC next to it. They were green color. 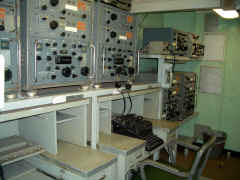 Those two pieces of equip above right I don't remember what they were. It was troop gear. 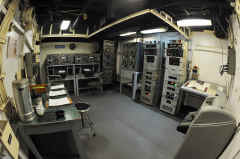 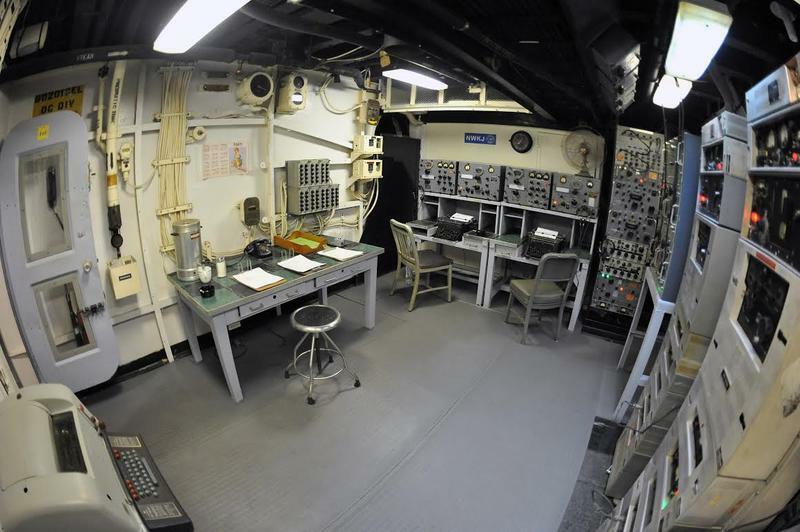 Most of the time we would have Marines aboard and they set up communications in here. 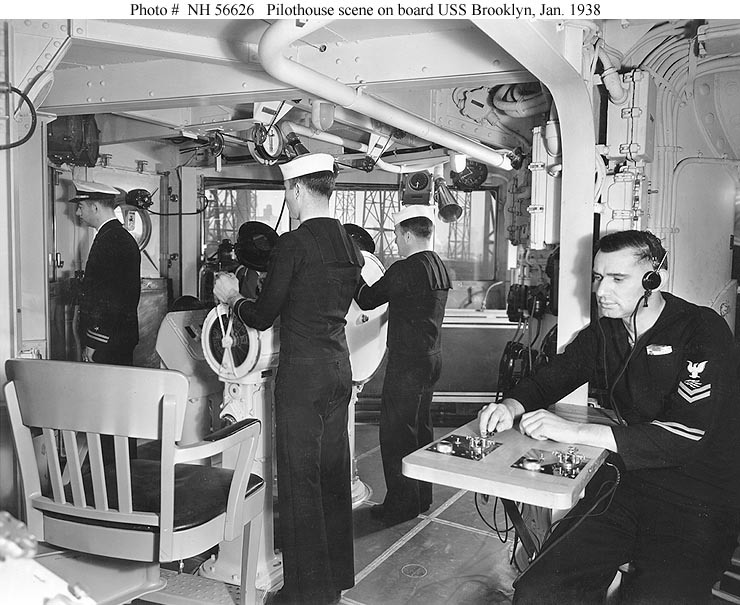 We did have the Army aboard maybe twice, once for sure." 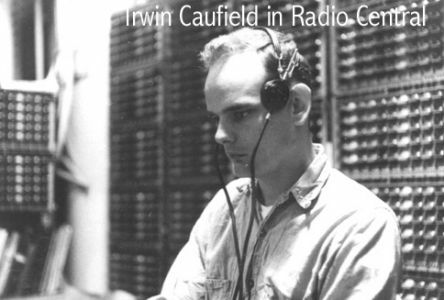 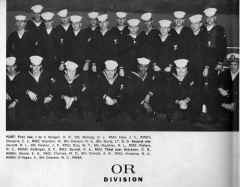 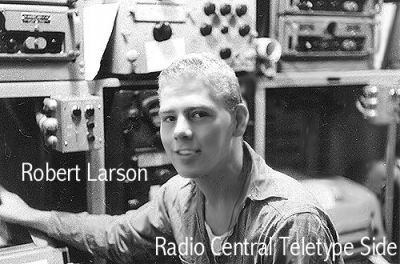 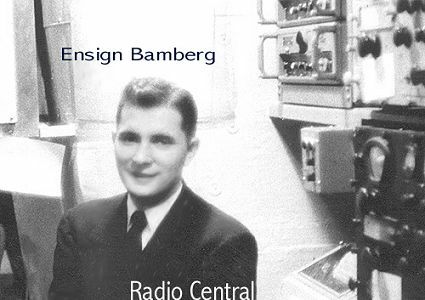 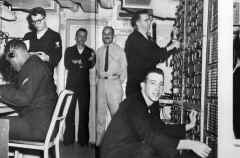 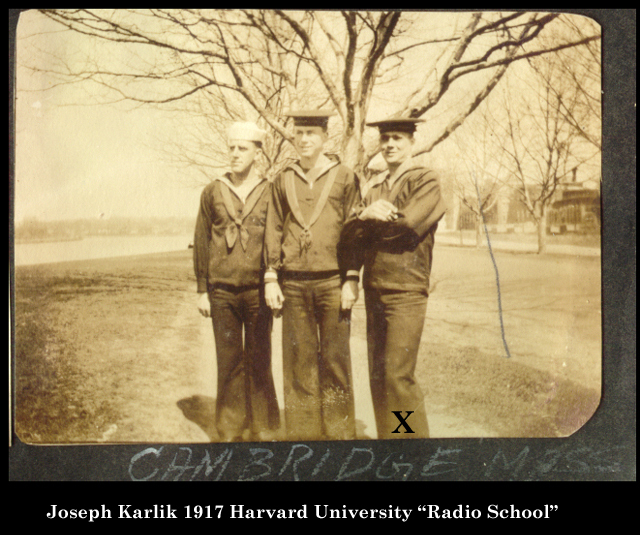 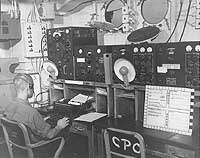 Radio Central - "On the door there was a list of all the ships in Squadron with their voice and CW call signs. 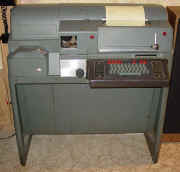 You could make notes on it with a grease pen. 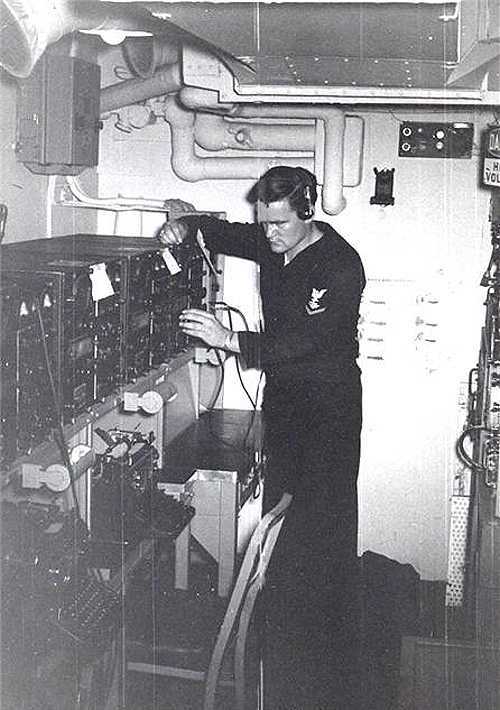 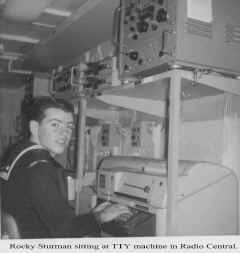 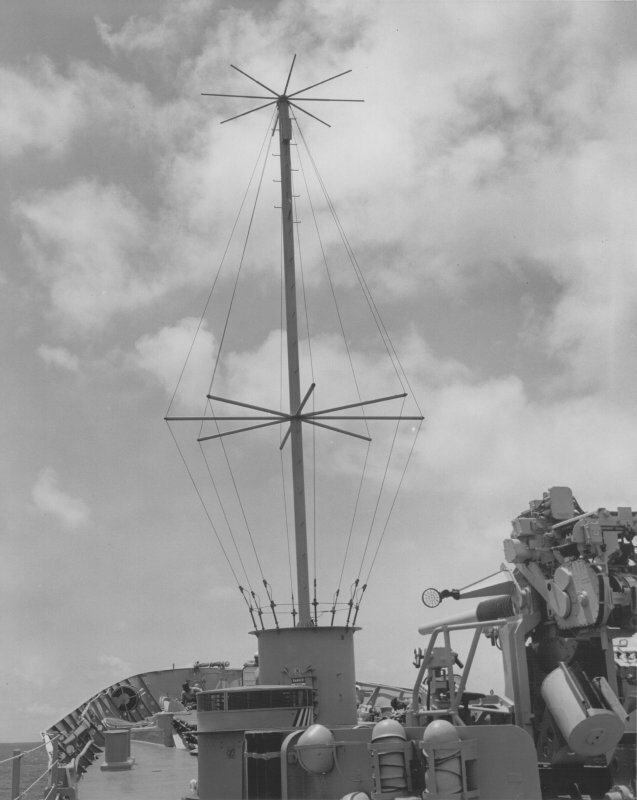 Above the Radioman was a small receiver that we used in port for music and out to sea we covered the emergency freq. 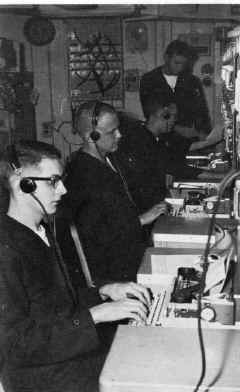 I think it was 500 kc. 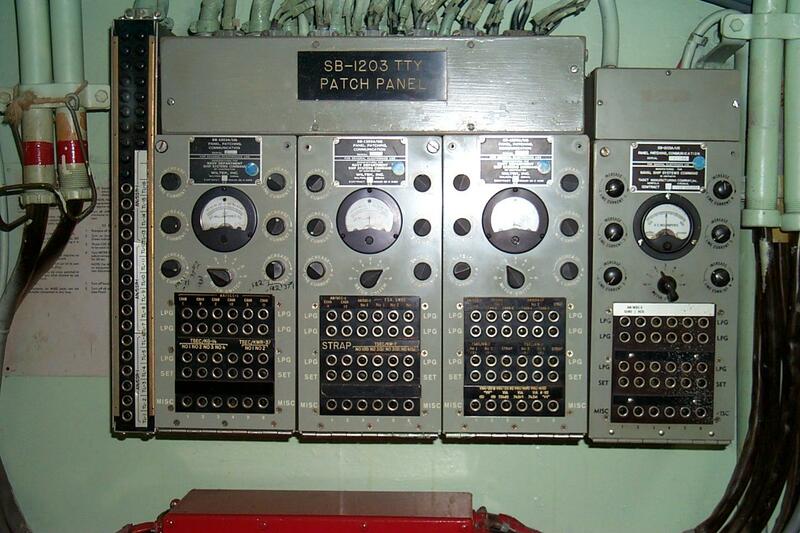 You can see the antenna patch panel. 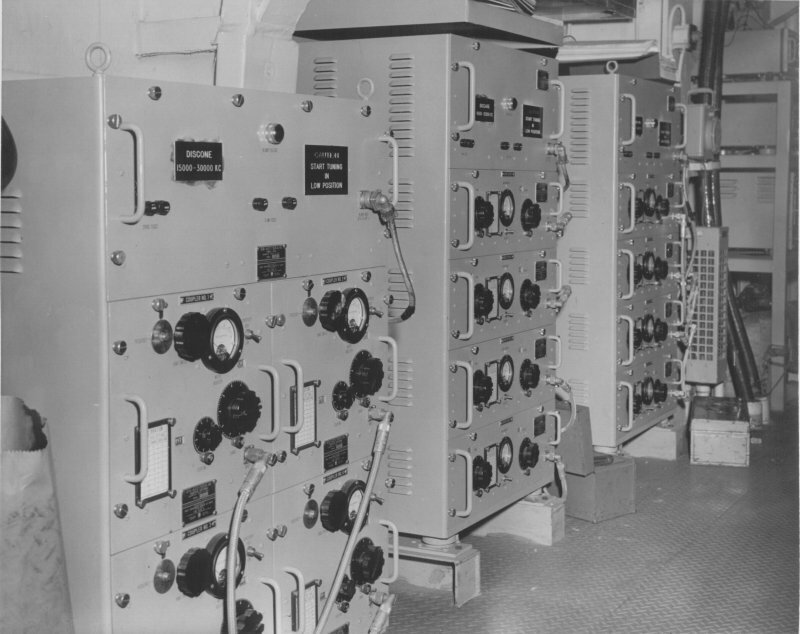 Sometime around 1957 or 1958 the ship had gone into dry-dock and had all this new equip installed, including the huge patch panels for the receiver and transmitters." 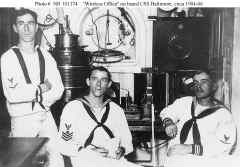 "...clowning around. 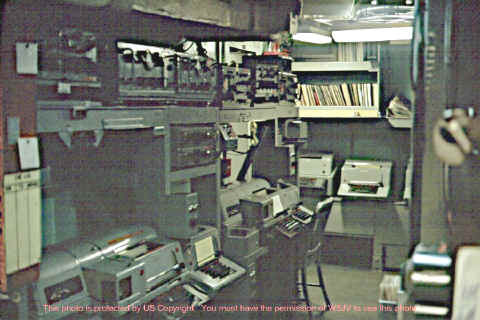 Shows the Fox Desk with the Model 28's copying the Fox broadcast. 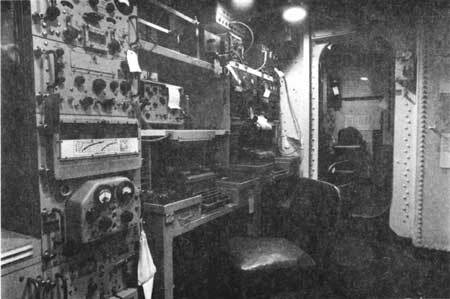 The guy seating behind the desk was from a Tacron Squadron that was aboard so they were implemented into the watch section. 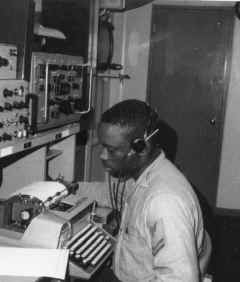 One radioman sat at that desk checking for messages for the Henrico, Comphibron One, Tacron, etc. 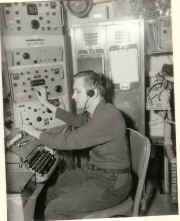 He also had to check for the encrypted call signs." 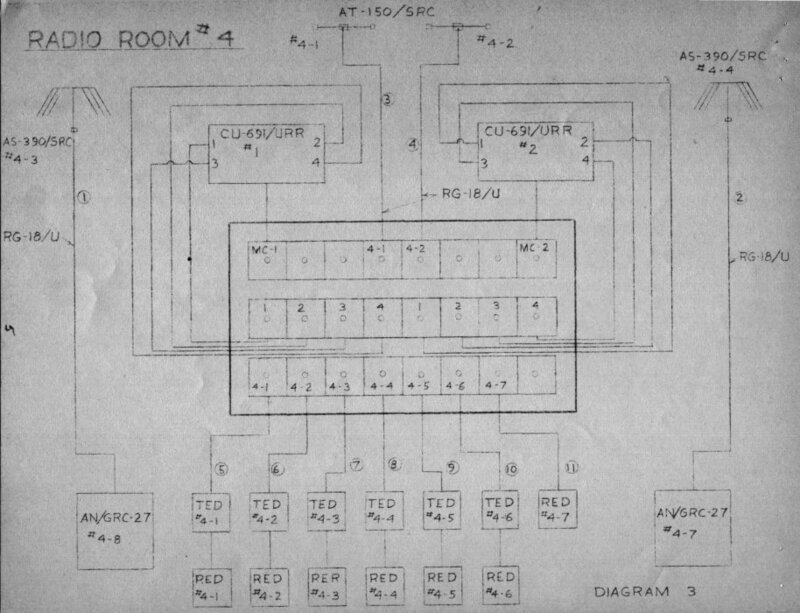 "These were the circuit positions. 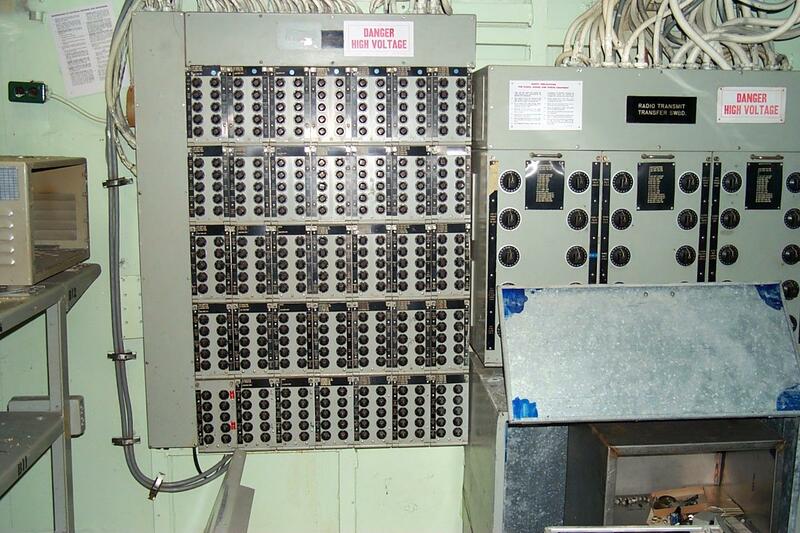 I think there were 3 or 4.It was where we handled the cw circuits. 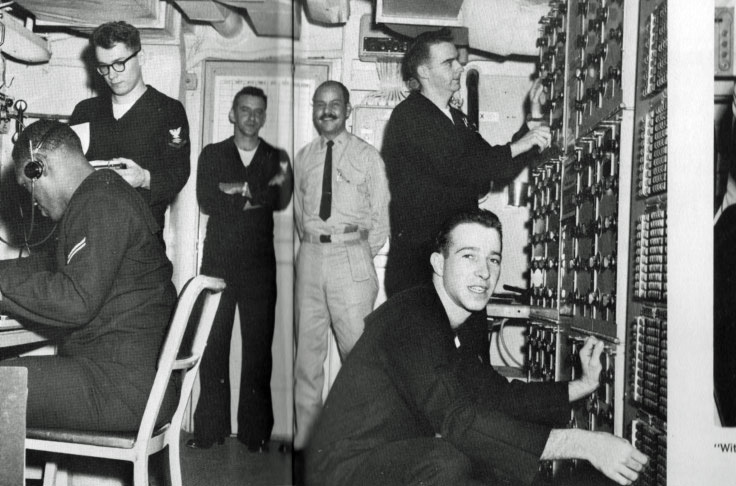 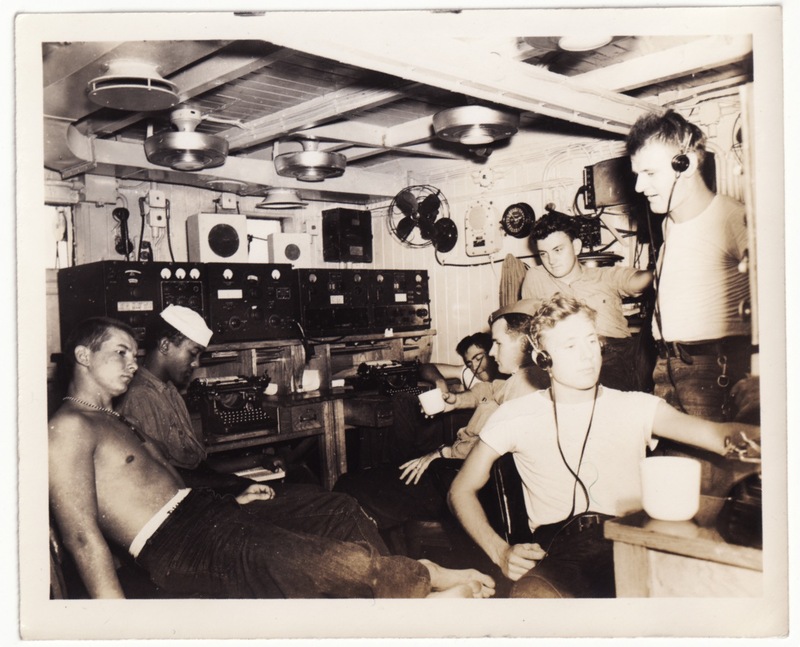 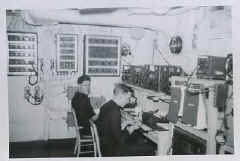 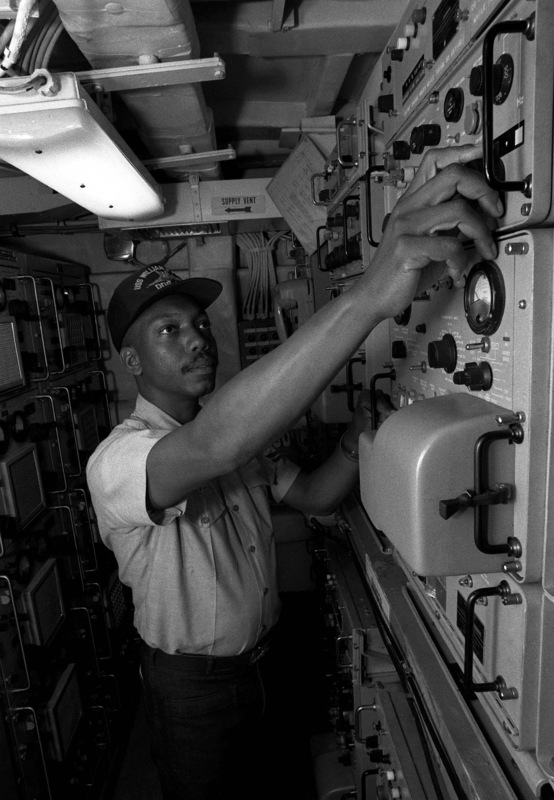 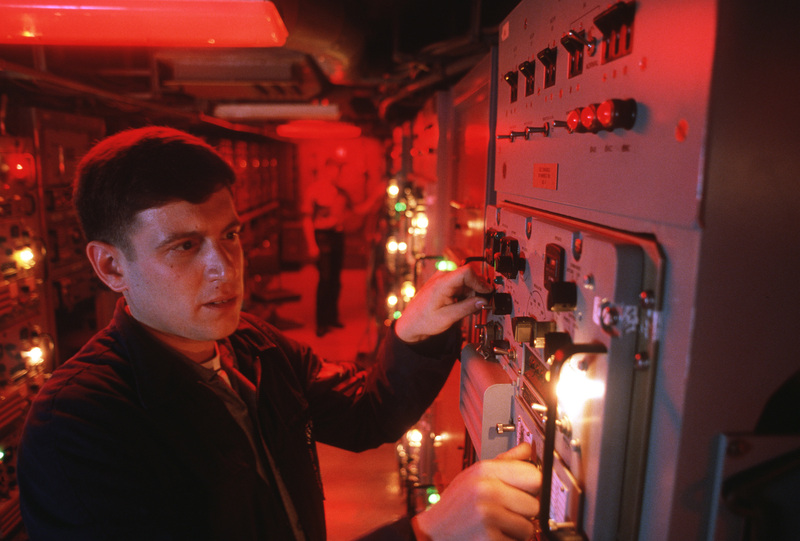 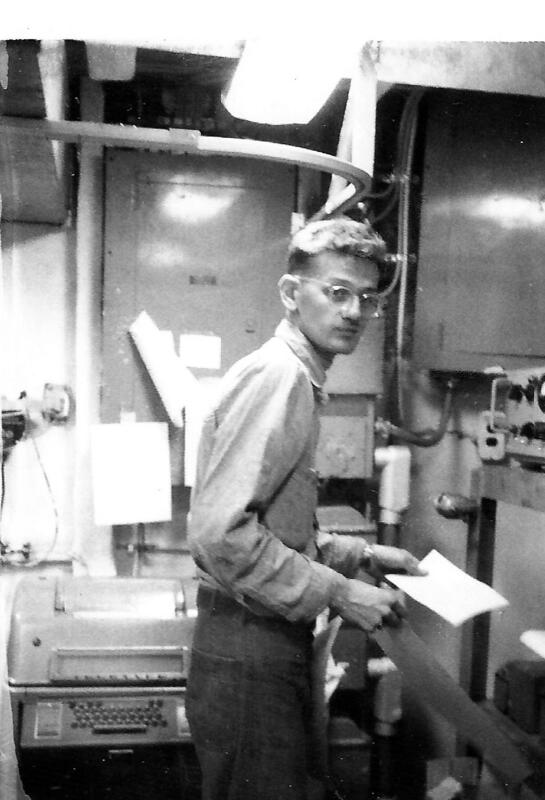 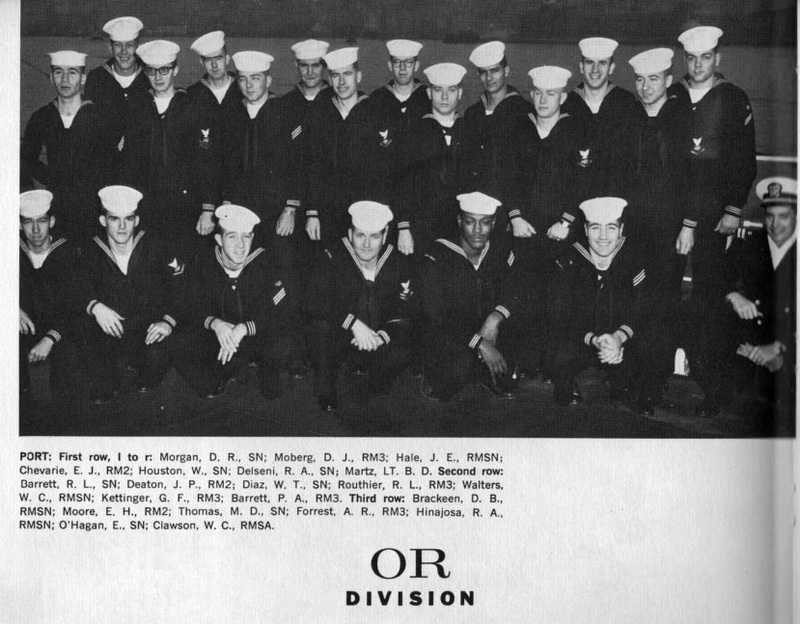 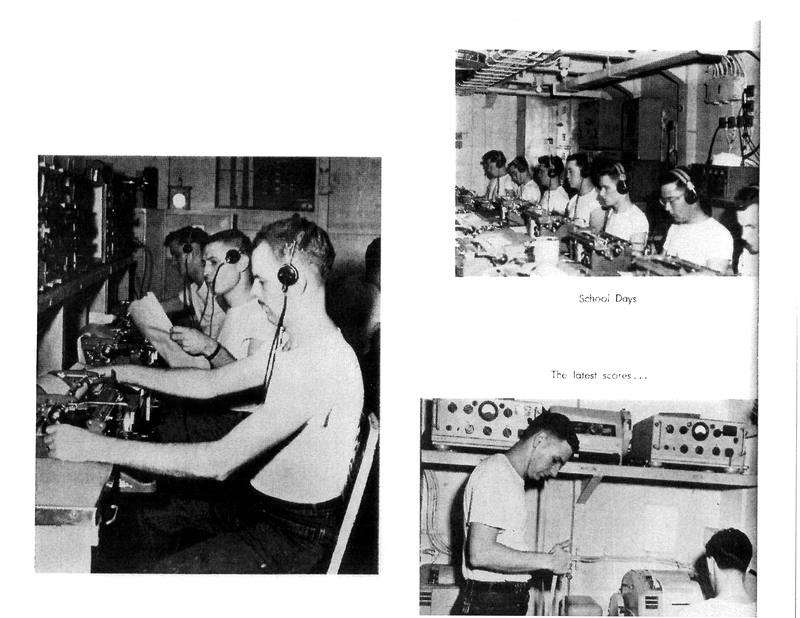 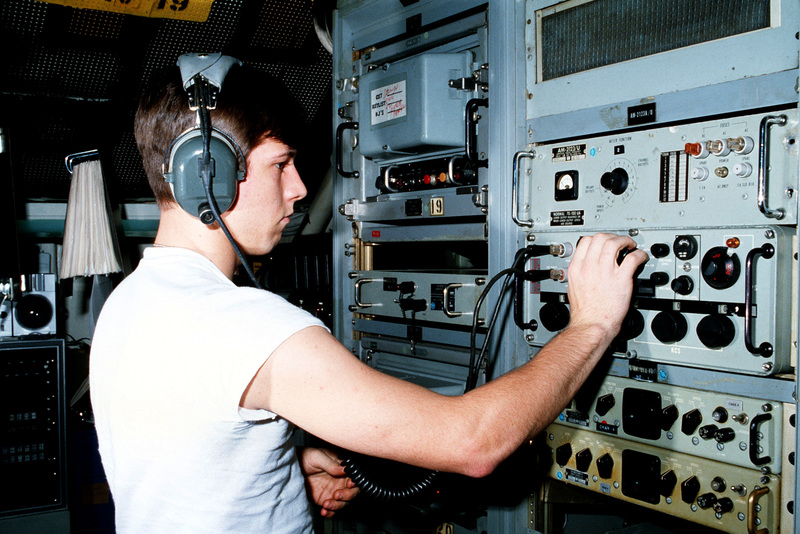 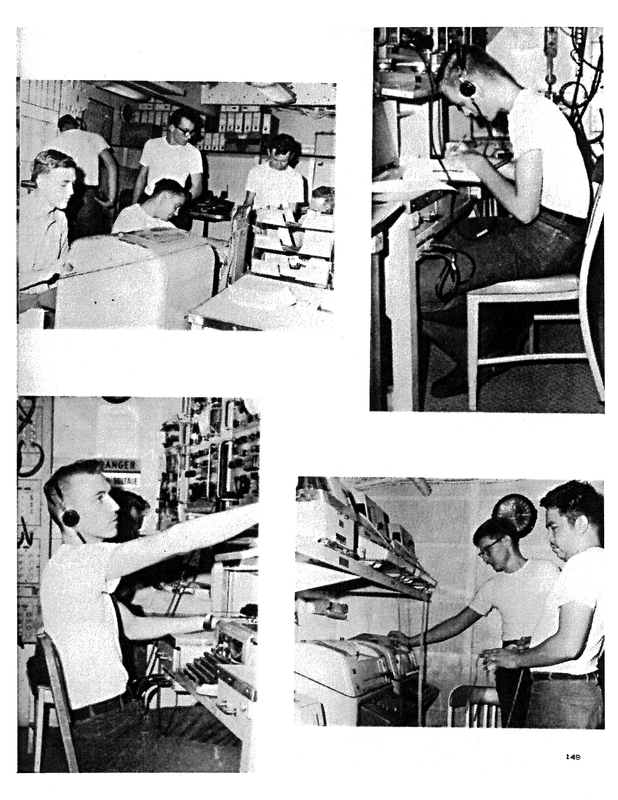 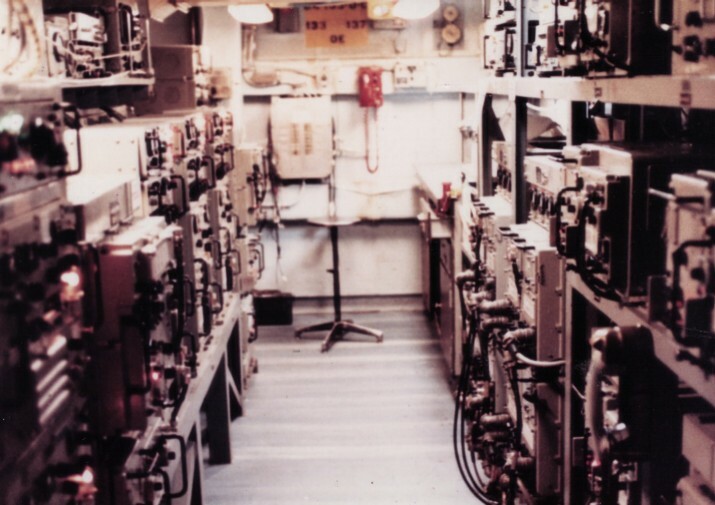 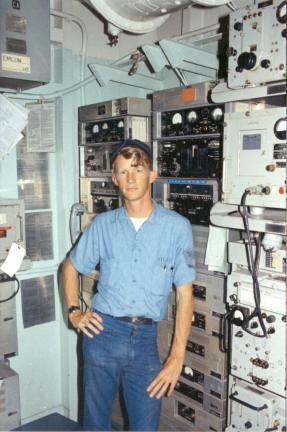 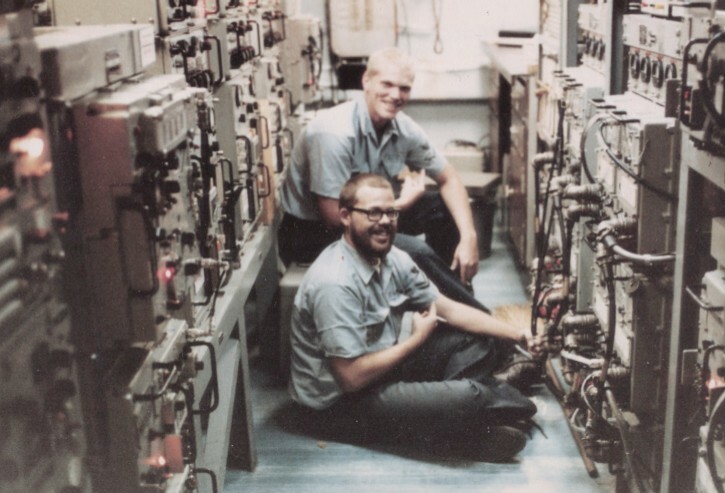 The receivers on the shelf were SRR-11 or 13's.RCA's.To the right was the Watch Supervisors Desk, he was actually the guy in the foreground with the pencil on his ear. 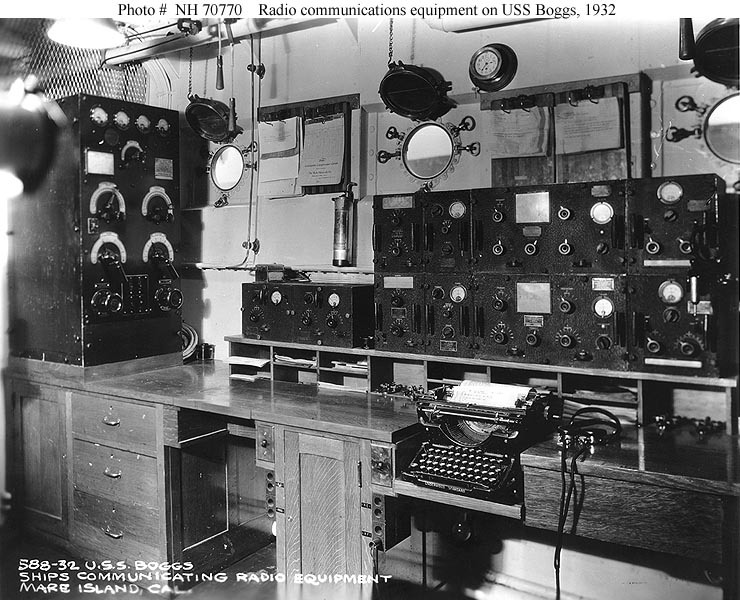 That desk was usually used for relay traffic. 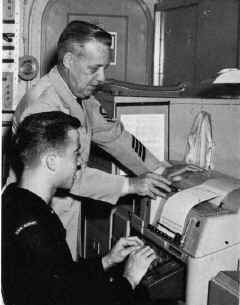 We would take or send the traffic within the squadron on the very first desk where that radioman is bending over. 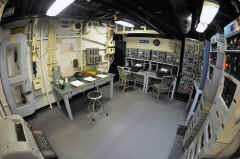 If it needed to be relayed to a Commsta it was done on the relay desk. 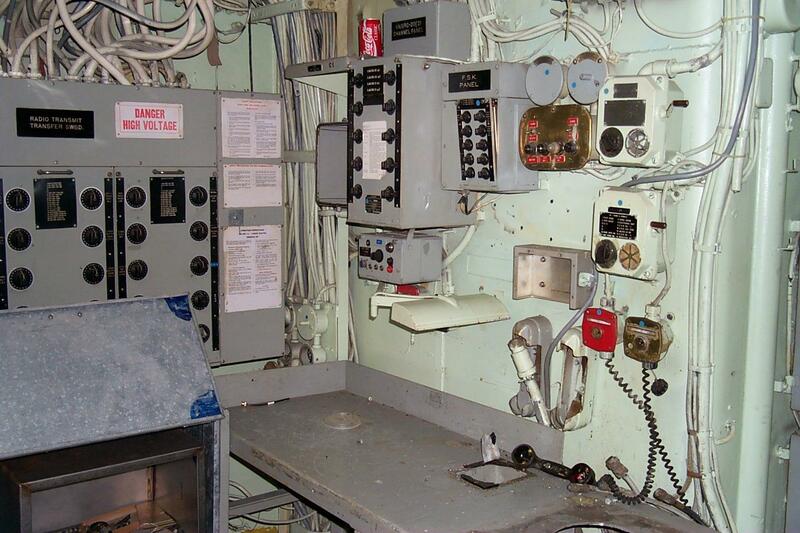 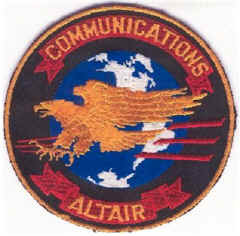 Over by the hatch/doorway to the weather deck was the antenna patch panel which you can't see." 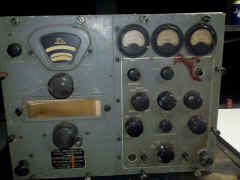 "We had mostly R390A's, tons of them. 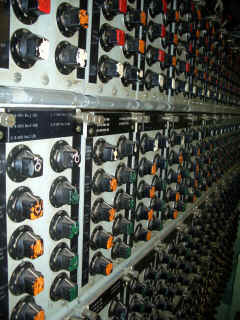 We also had a few other receivers, can't remember the model but they were used for LF mostly. 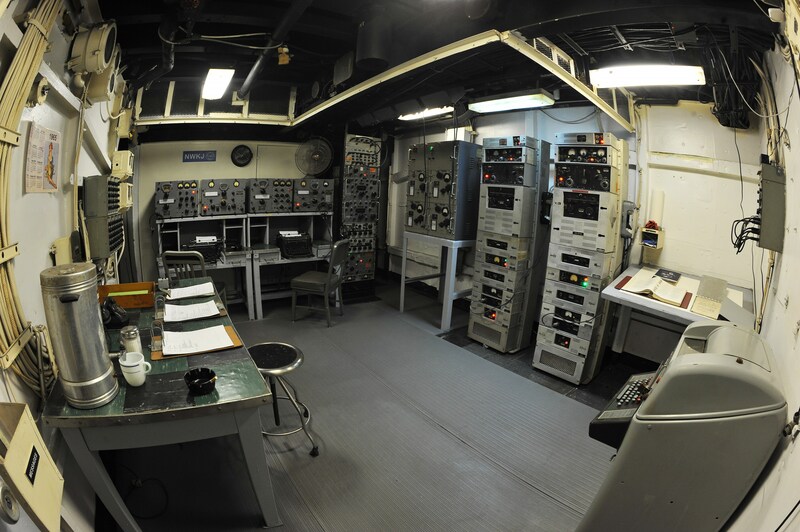 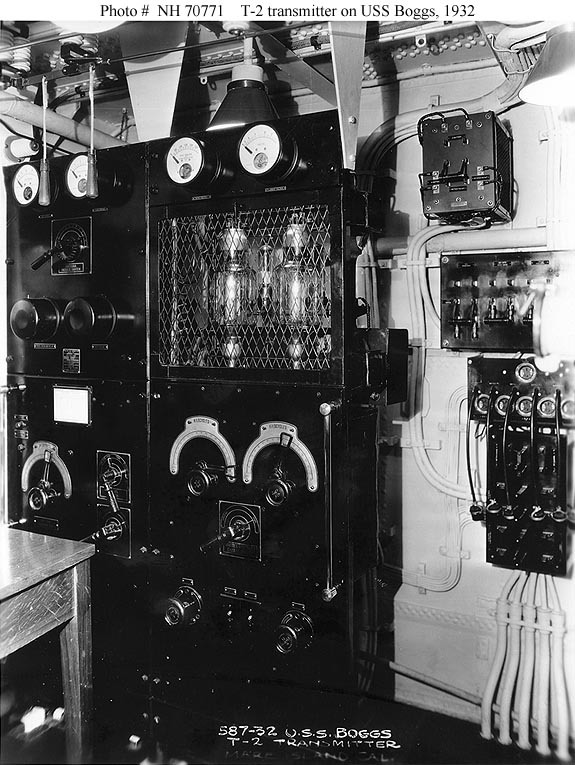 The main transmitter room on the main deck had 2 WRT-1's, 3 WRT-2's and 2 URC-32. 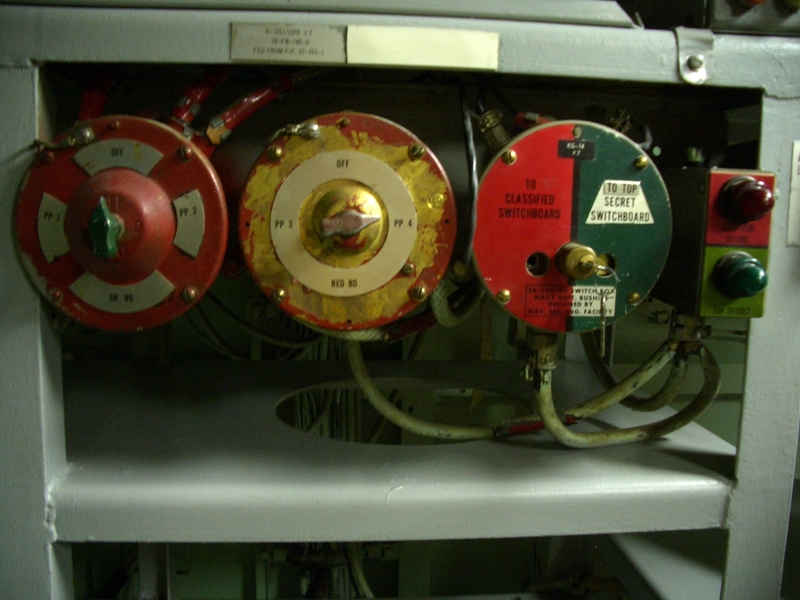 Also had multi-couplers feeding a vertical fan amidships and a horizontal fan aft. Also had a HF discone on the bow. The URC-32's had the remote tuners at the base of 35' whips. 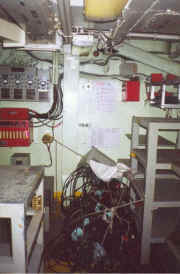 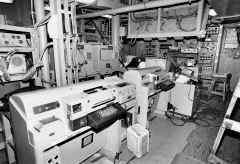 The auxiliary radio room on the main deck had a WRT-1 and a TBS. 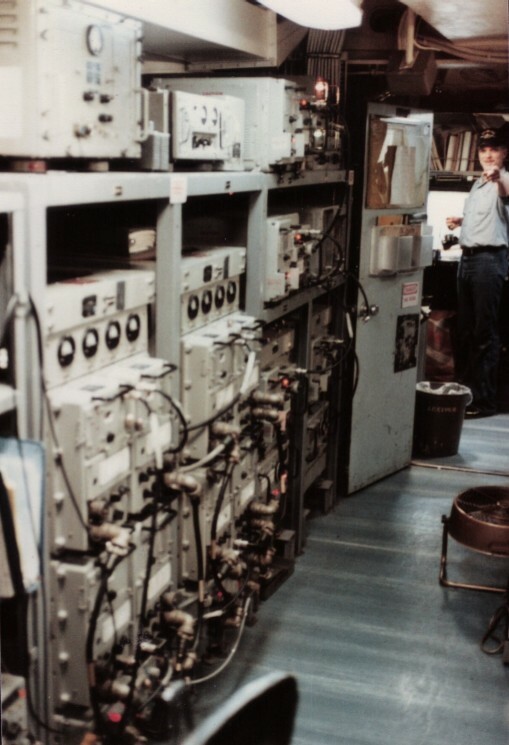 Don't recall much about the VHF/UHF gear but had a room full on the 01 level. 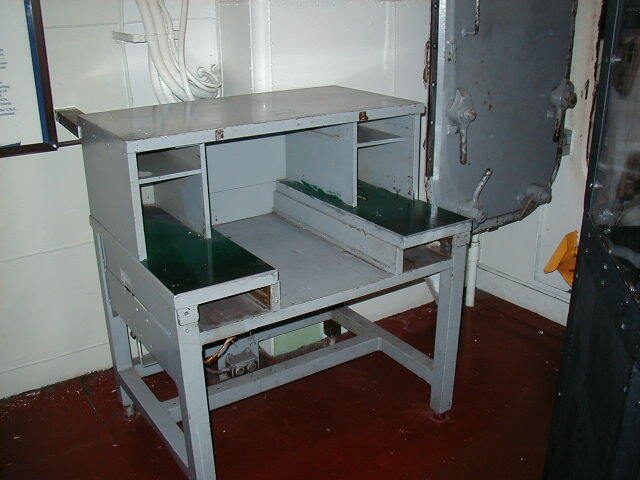 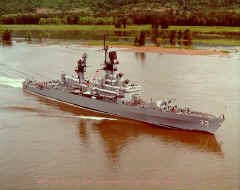 I am a Albany Plank Owner from the 1962 commissioning. Shortly after commissioning we were "asked" to donate $5 or so towards the purchase of 2 Vibroplex bugs. 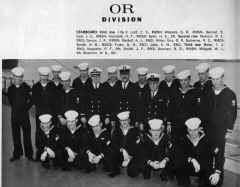 Navy wouldn't buy them for us." Radio Room 1 Panorama - R-390A, SGC-1, SRR-19, BRR-3, WRR-3, R-1051, URA-17, TTY patch panels, xmtr & rcvr switchboards, SRC-21, SRR-11? 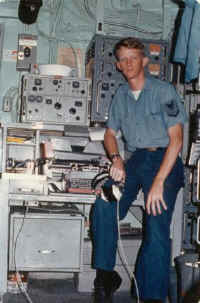 Jon Collins RM3 with an R-390. In 1969 we were equipped primarily with R-390s with CV-591 SSB converters and URA-8s. 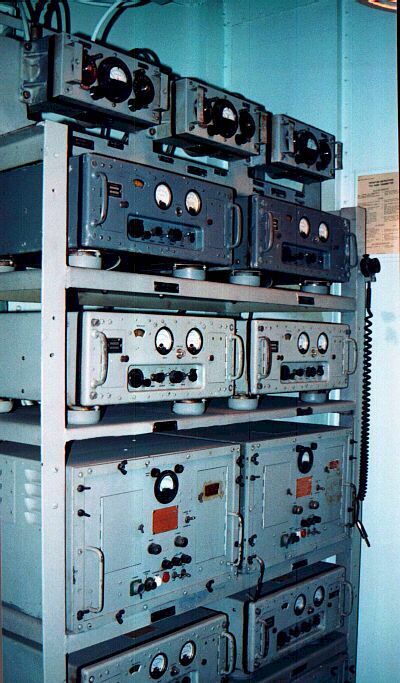 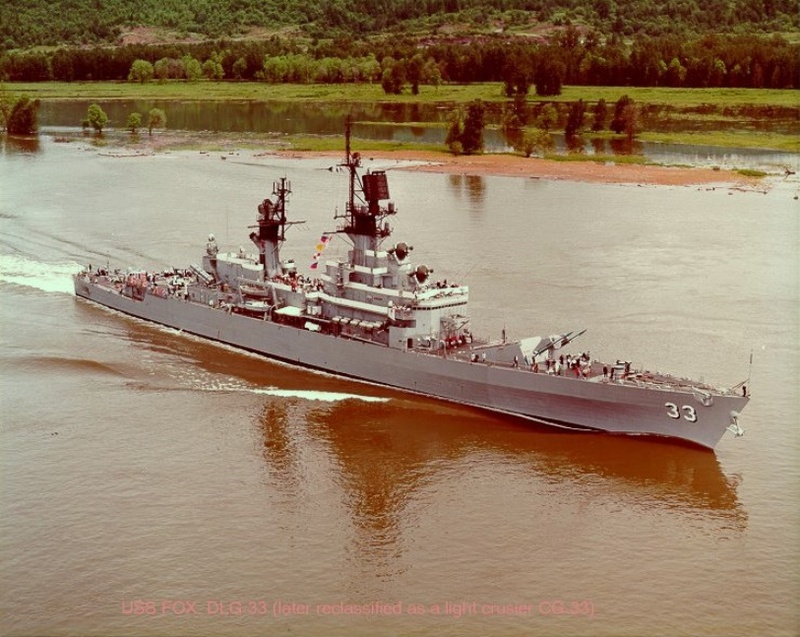 In 1970 we replaced most of the 390s with R-1051s and URA-17s. Behind him is a number of TED/RED pairs for UHF. 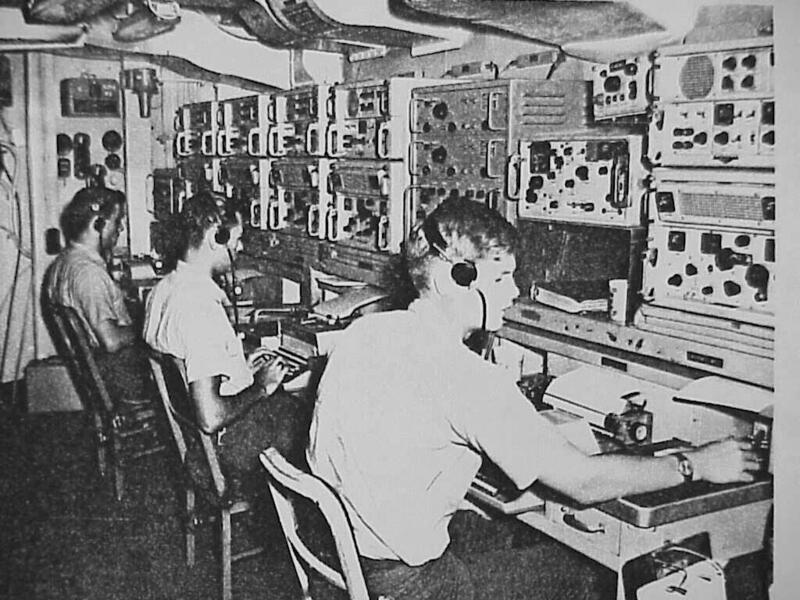 In 1970 they were replaced with URC-9s. 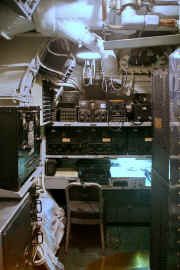 Gary Green RM3 is at our CW (rarely used) operating position. 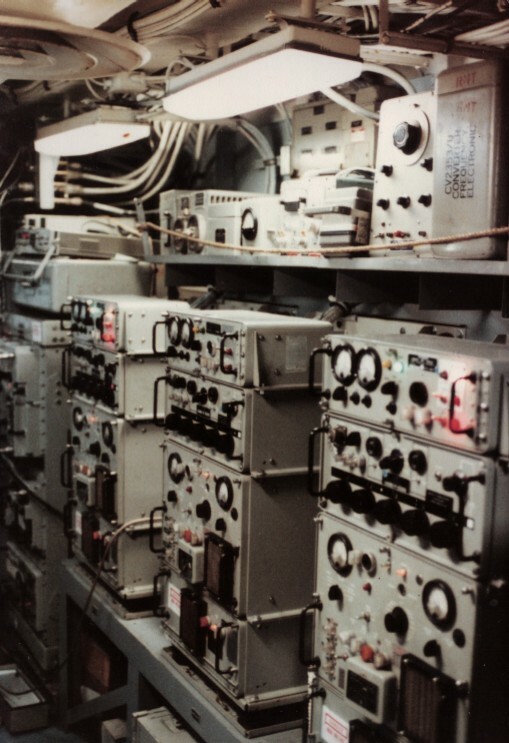 In the upper left next to the R390 is the SRR-19 which was used for receiving multiplexed fleet broadcast transmissions. 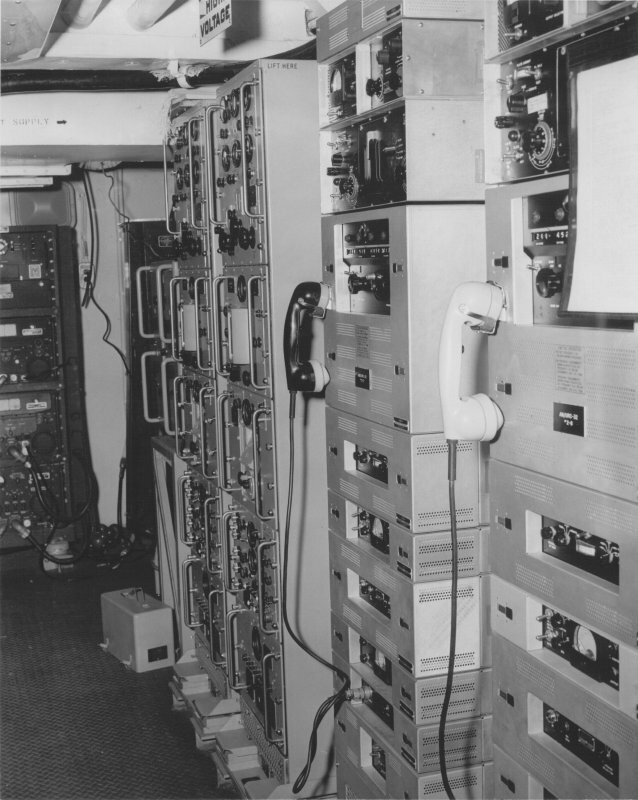 We were capable of receiving 4 channels via a UCC-1 multiplex terminal. 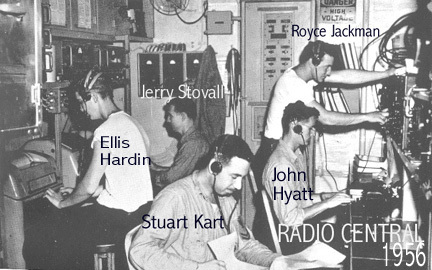 John Nyeholt RM1 is sitting at the supervisor's desk. The door behind him (normally left open) goes into the Secure TTY and Offline Crypto Rooms. 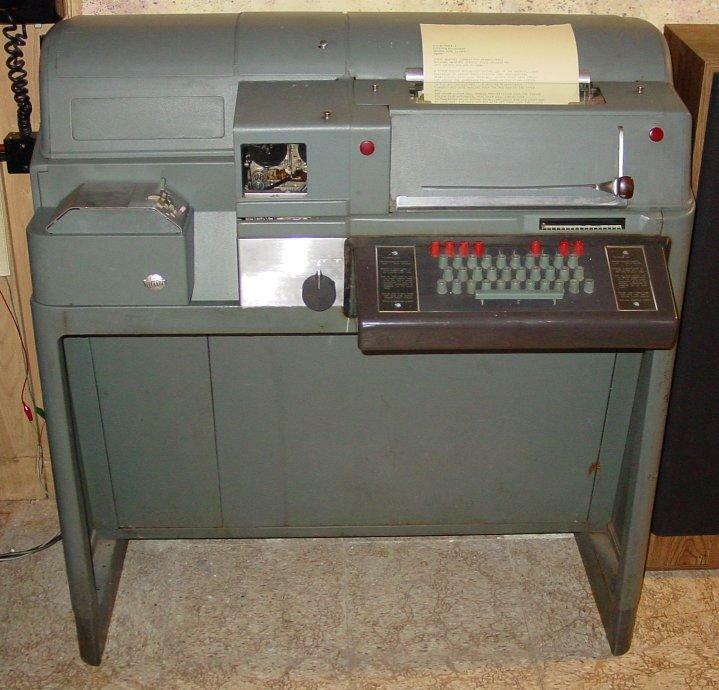 The Model 28 KSR in the foreground was set for 60WPM and used for copying press broadcasts. 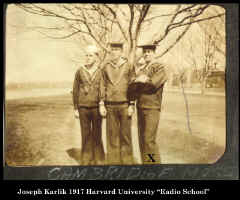 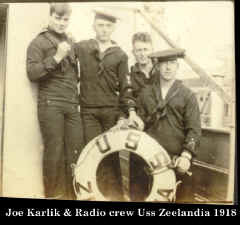 Photos thanks to Jerry Karlik - in WW1 his father Joe served aboard Zeelandia and Morse, and in WW2 aboard Abbott DD-629 and Maddox DD -731 - Jerry was also a Navy RM.